Answer: As we say in the business, “good eyes.” You have noticed a very real effect that can be traced to the path taken by the Sun through the sky. But first, let’s clarify exactly what we mean by twilight. Twilight begins when the sun has totally set, and no part of it is visible. That’s the easy part. 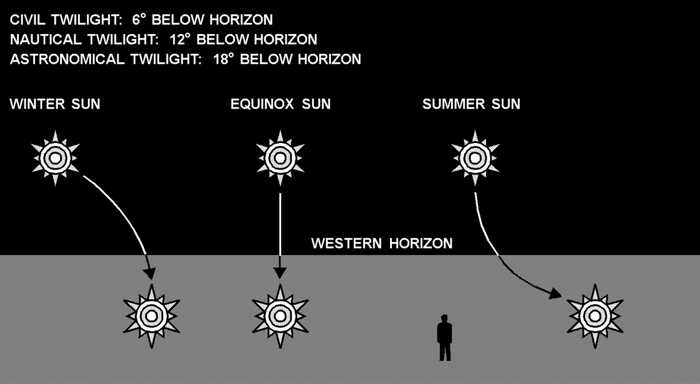 Twilight ends when the Sun is far enough below the horizon that the sky is suitably dark for your purposes (hence the three definitions above). The seasonal difference here is 21 minutes. Note how, in the Spring and Fall, when the Sun’s path carries it nearly straight down, twilight is the shortest. Of course, your results may vary. At the poles, twilight can last all day.